One thing I have missed terribly since going gluten-free is a good doughnut. It’s not like I ate a lot of them BGF (before gluten-free)–I would indulge perhaps a few times a year. But just the fact that I couldn’t have one, the idea that people could line up at the apple orchard for hot cider doughnuts, or even go to Dunkin’ on a whim for Pete’s sake (and I could not), was deeply upsetting. I had tried gluten-free doughnuts (mostly the packaged variety) and was underwhelmed to say the least. But a while back I had a maple doughnut from Zest Bakery. It was a wonderful thing–dense, soft, moist and spectacularly redolent of maple syrup. Best of all, it didn’t fall apart when I gave it the requisite dunk in my latte. 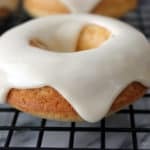 It absolutely restored my hope that maple doughnuts could be good when made gluten-free. And it inspired me to go out and get my own doughnut pans (because sadly I live too far away to go the bakery on a regular basis). My first effort was a fail. I tried a combination of sorghum, millet and tapioca flours and added sour cream for moisture. They rose high out of the pan and when inverted,looked quite a bit like flying saucers. A brilliant friend suggested we use them as strawberry shortcake cups. It was the perfect solution for a sadly misshapen doughnut. But I needed to try again to get what I was after. The second time around (after consulting a few more recipes) I combined rice and millet flours with tapioca flour, and instead of sour cream, I added powdered milk. The resulting maple doughnuts were much more in line with what I was hoping for. They were sturdy but tender, flavorful, and perfect for dunking in my coffee. Preheat the oven to 375 degrees and grease a doughnut pan (for 6 doughnuts). Mix the dry ingredients together in a large bowl. Whisk the wet ingredients in a smaller bowl until smooth. Whisk the wet ingredients into the dry and beat until smooth. Place the batter into a zip-top bag, snip off one corner and pipe the batter into the prepared doughnut pan (it’s so much easier than trying to spoon it in!). Bake doughnuts for 12-15 minutes, or until a toothpick inserted into the thickest part comes out clean. 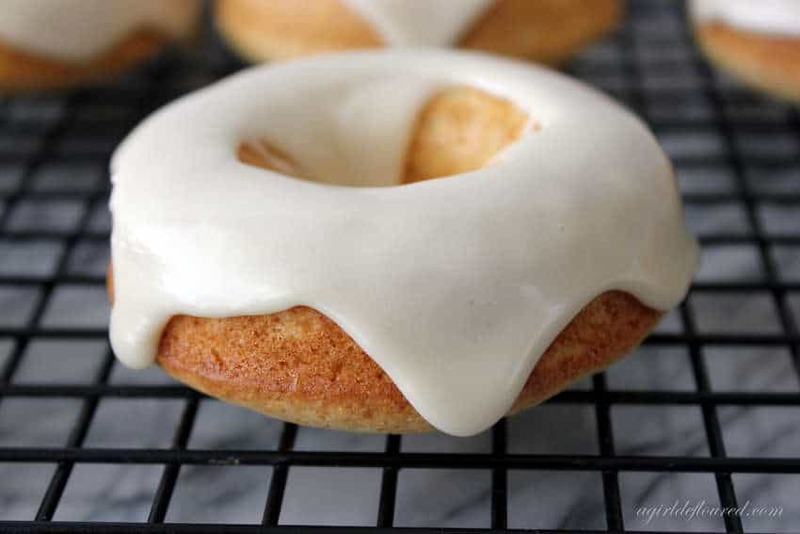 Allow doughnuts to sit in the pan for 5 minutes, then turn out onto a cooling rack. Cool completely before glazing. Make the glaze. Sift the powdered sugar into a bowl. Whisk in the milk and extract until smooth. If the glaze is too thick, add more milk. If it’s too thin, add more powdered sugar. Drizzle the glaze over the tops of the doughnuts. These are best eaten the same day. This entry was posted in Baked Goods, Desserts, Recipes, Recipes & Techniques by Cooks We Love and tagged A Girl Defloured, Alison Needham, food allergies, g-free diet, g-free doughnuts, gluten free baking, gluten free doughnuts, gluten free food, gluten intolerance, homemade g-free doughnuts. Bookmark the permalink. ← Cookie Toffee Bark: Top 8 Allergen Free!